As sunlight filters through my home this Friday morning, I feel relaxed and happy. Its amazing what sunshine can do to you when you have to survive the winter months in the Seattle area :) However, this year, I really can't afford to complain with all the bad weather in the East Coast!! We, on the other hand have been pretty fortunate! My prized possession at home, is this trunk filled with my personal memories created by the very talented Chandan Dubey. Next week, I shall take more pictures and share the details and the story of how this trunk was created! Image: My home this morning! The trunk is indeed gorgeous piece of art. Chandan has crafted those details extremely well....A conversation piece indeed. I was awed by her attention to miniscule details. It's one of a kind and its the BEST addition to your home for this year. 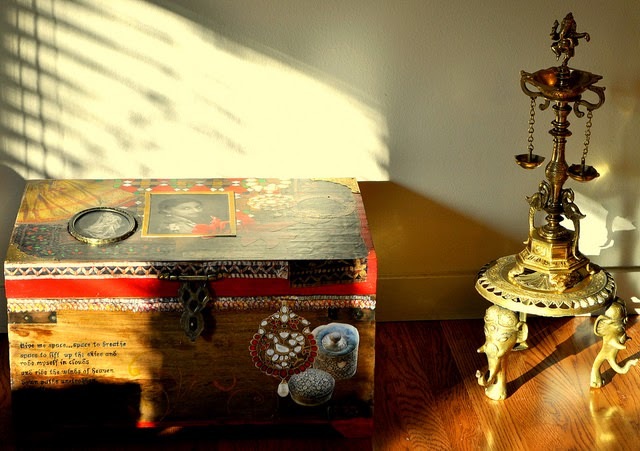 That's a gorgeous trunk and stunning brass diya. Can't wait to see more images and to know about the story of trunk's creation.